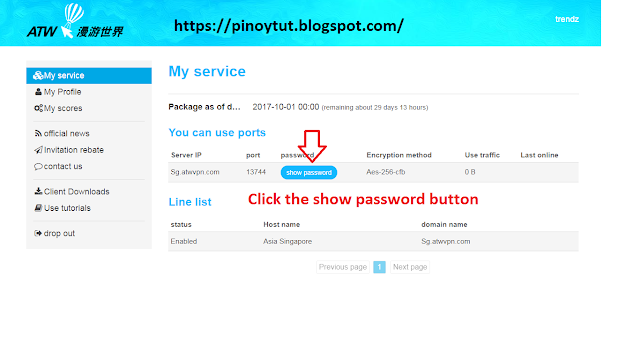 Whats the different with my shadowsocks tutorial? this tutorial is easier like counting one two three. ATWVPN - is an Chinese website and you must use browser translator to understand the web content. I currently use google chrome for automatic translation. create an email or your existing email address. Email Fake-I recommend this website to create email as your temporarily email address. Likewise input your username,email adress and your desired password.Tip it easy to remember your account to make the same username and password.Then after inputing those fields click submit. "Thank you for registering ATW Roaming World, ATW Roaming World is a technologically advanced, simple and smooth network agent to accelerate our products, and we are committed to providing a stable and high speed website agent / acceleration service. After activation, you will receive a free package for one month." 3.Once you succesfully activate your account it will directly you to the homepage. That's it you have one months shadow socks account. This is my sample shadowsocks account. 4.Lastly before i forgot and sure you would asked me where will we get the password?. Simply by just selecting the button "show password" and it will prompt password information. That's it copy the password.